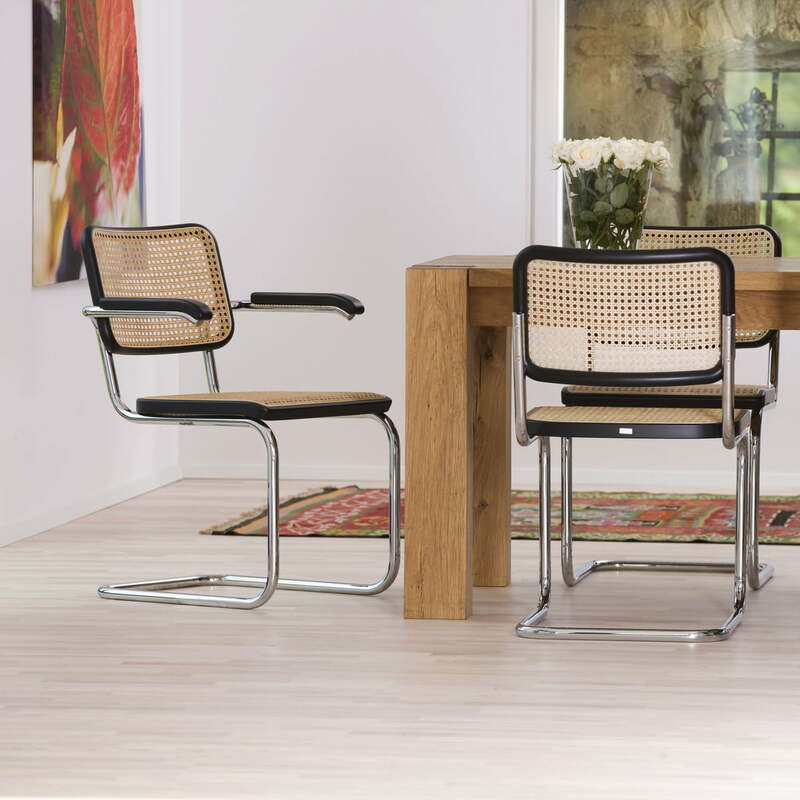 Thonet - S 64 V Chair, chrome-plated / black stained beech (TP 29) / wickerwork with supporting synthetic mesh. 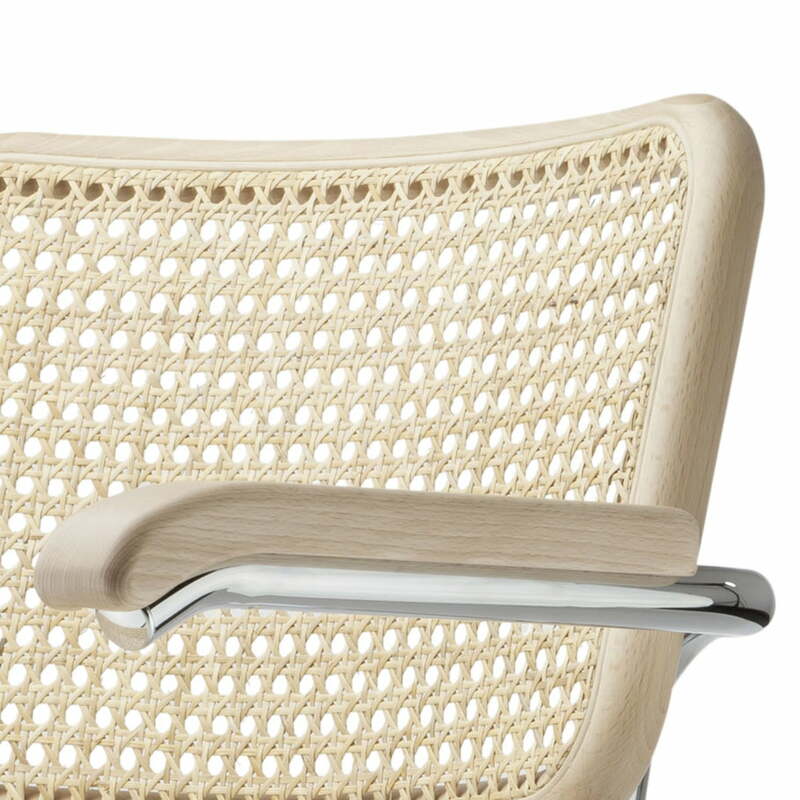 Thonet - S 64 V Chair, chrome-plated / black stained beech (TP 17) / wickerwork with supporting synthetic mesh. The S 64 chair is one of the most popular chairs of the 20th century. of the 20th century.The most produced cantilever in the world features the iconic conbination of tubular steel, wood and wickerwork. The cantilever chair with an upholstered seat is available in leather, fabric or mesh with different colour combinations. The chair adapts to any environment thanks to its clear appearance. It fits in just as well in modern conference rooms as it does at home in the dining room or study. The S 64 consists of a bent chrome-plated tubular steel frame and two wooden frames made of stained beech for the backrest and seat. There are various materials available for the seat and back. The design of the iconic chair was designed by Marcel Breuer in the late 1920s, based on the design by Mart Stam, who created the V 64 and V 32 chairs. Details Glides are not included! S 64 V Chair by Thonet, chrome-plated / black stained beech (TP 29) / cane lined with plastic mesh. 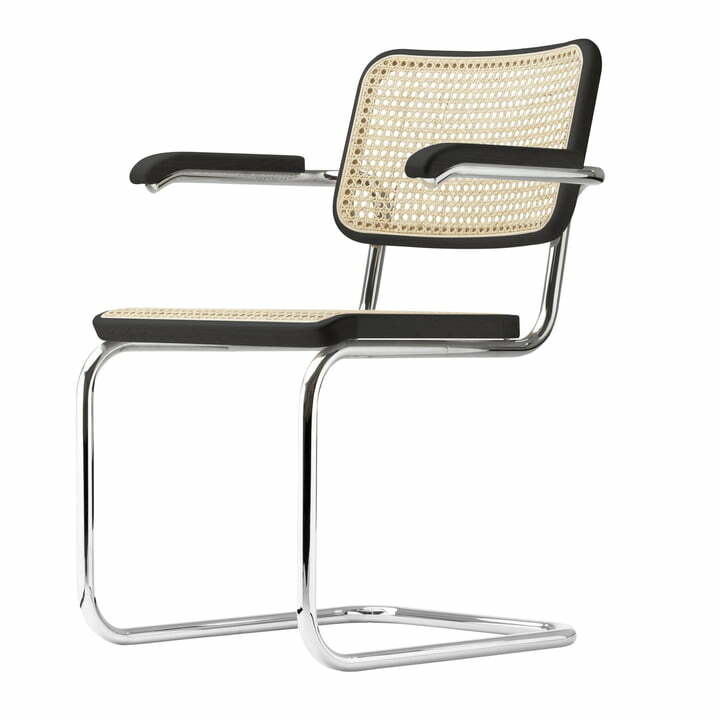 S 64 V Chair by Thonet, chrome-plated / black stained beech (TP 29) / cane lined with plastic mesh. The S 64 V chair is one of the most popular chairs of the 20th century. Detailed product image: The S 64 consists of a bent chrome-plated tubular steel frame and two wooden frames made of stained beech for the backrest and seat. 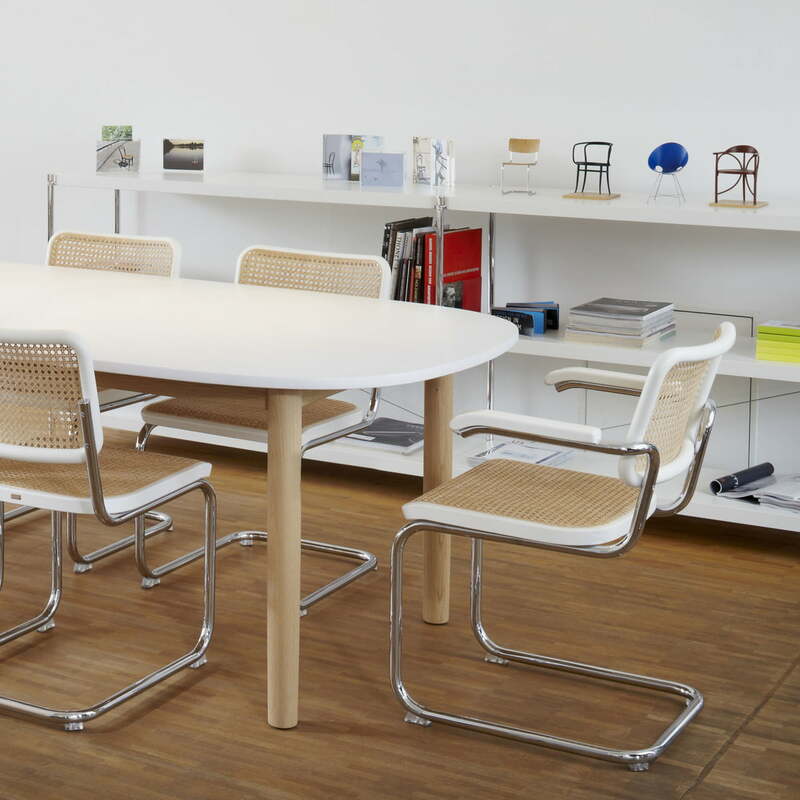 Lifestyle product image of the S 32 and the S 64 chairs by Thonet. 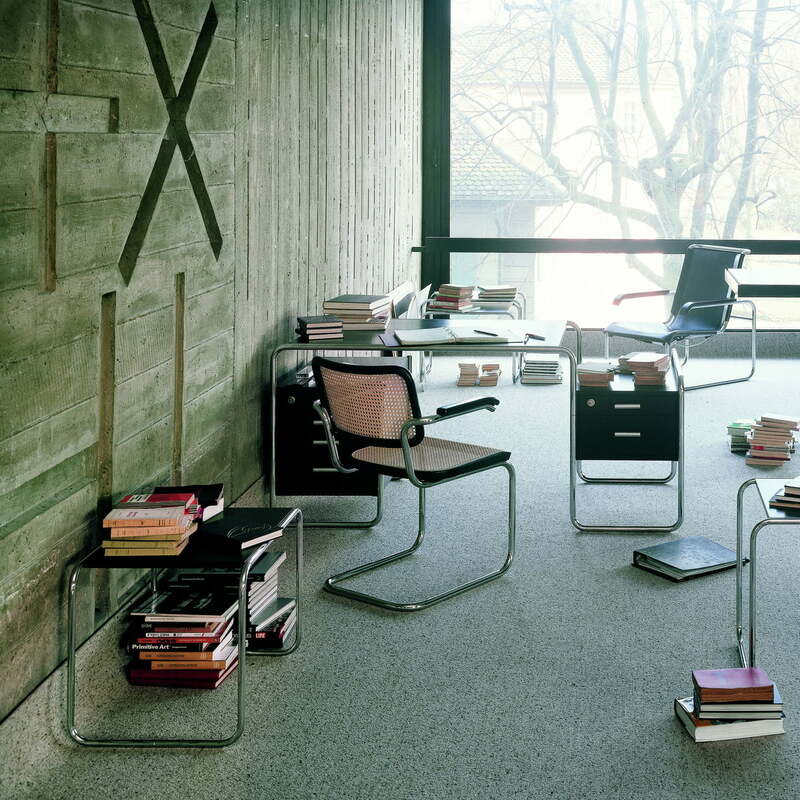 The S 32 cantilever chair by Marcel Breuer's is also available in S 64 chair version with armrests. 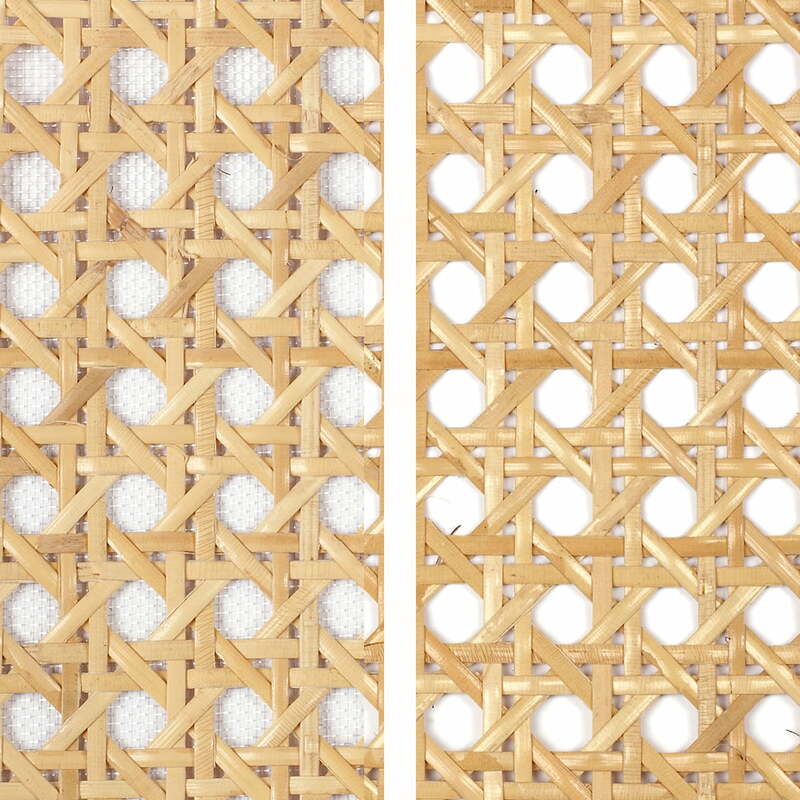 Lifestyle product image of the S 32 & S 64 chairs by Thonet: The fabric with wickerwork in various colorus is supported by a plastic mesh, which provides stability. The iconic chairs S 32 and S 64 by Marcel Breuer are available in classic wickerwork versions as well as with plastic supporting mesh. The plastic makes the chair more stable and long-lasting.